A total of 45 macrolichens and three lichen-associated parasites was observed in the permanent plots established during the study (Table 1). These species make up epiphytic macrolichen communities typical of the midatlantic region at the present time. Many of the dominant species are nitrophilous and/or pollution-tolerant (Punctelia rudecta, Flavoparmelia caperata, Myelochroa aurulenta, Physcia spp. and Phaeophyscia spp., Pyxine sorediata), and they have likely dominated lichen communities in the eastern United States for much of the past century. When comparisons can be made (see floristic data for Plummers Island, CHOH09), present-day communities are less diverse and contain fewer sensitive species than communities that existed at the same sites in the past century. Certain lichens found only in CATO are typical northern and mountain species. Communities in the parks closest to the center of Washington, D.C. (NAMA, NACE) had the fewest species with the lowest abundance scores. These communities were made up mostly of pollution-tolerant, nitrophilous species (Physcia millegrana, Punctelia rudecta, Flavoparmelia caperata, Phaeophyscia rubropulchra). Pollution sensitive species are uncommon, but found throughout the study area (Tables 1 and 2). Table 1. Summary of macrolichen collections made in each of the nine park units participating in the study. A link to the species lists and abundance scores is available for each entry. Mountain flora (northern Allocetraria oakesiana and western Flavopunctelia soredica); Peltigera canina collected off-frame. Historical floristic data available for Plummers Island, Maryland (CHOH09). Historical collections from Great Falls, Maryland, available in the U.S. National Herbarium. Tolerant nitrophilous species dominant (Physcia millegrana, Candelaria concolor, Punctelia rudecta). Collema furfuraceum, Peltigera canina collected off-frame. Historical collections available in the U.S. National Herbarium. Nonmetric multidimensional scaling revealed significant patterns in the floristic data (Figure 1). Lichen communities in PRWI and CATO are especially distinct, with each having species not found in the other parks. Other parks are intermediate in floristic composition. This likely reflects differences in their geographic locations (axis 1), but may also indicate effects of past pollution. 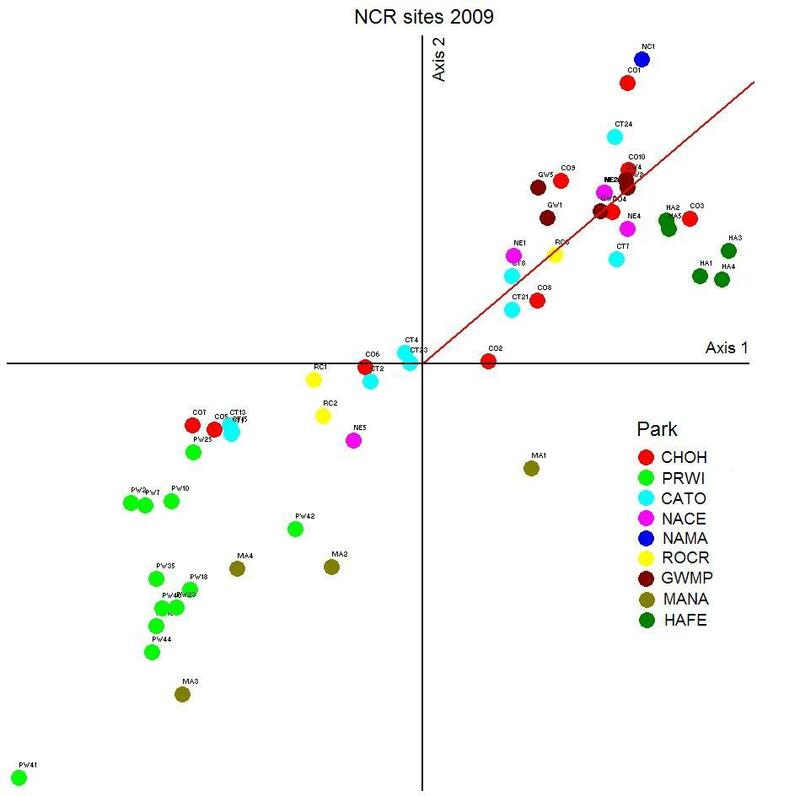 Communities of the three most urban parks (NAMA, NACE, ROCR) are also distinct, likely a reflection of their low diversity (axis 2). Integrating floristic data in this way provides a basis for comparison in the future. Figure 1. NMS ordination of lichen floristic data obtained at each of the 102 plots established in the NCR. Concentrations of sulfur and metals were measured in the test lichen Flavoparmelia caperata, collected from each of the 102 plots. Data collected in 2004 are for seven of the participating park units (Table 3). Data from HAFE and MANA were collected in 2006. 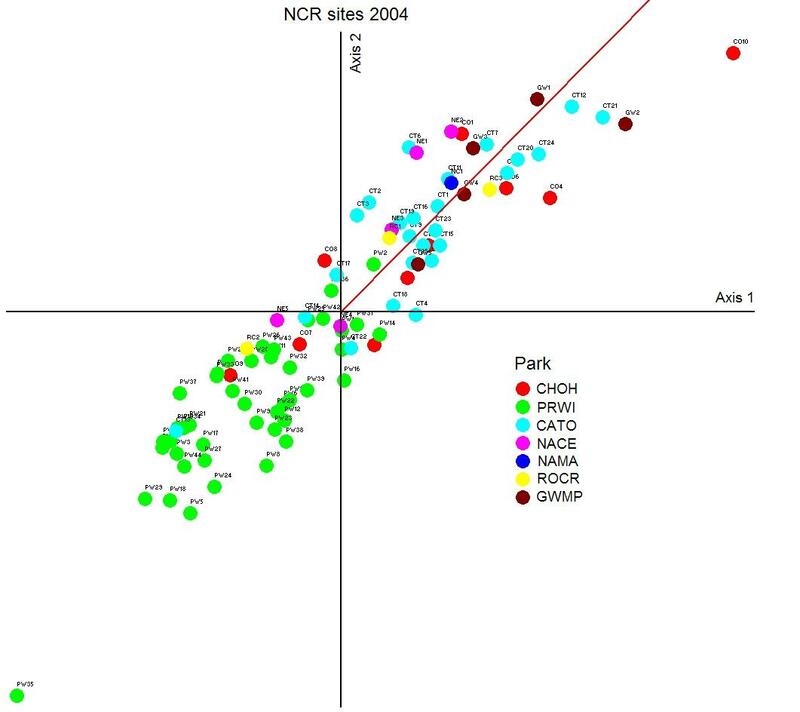 Results from resampling selected plots in 2009 are also provided. Element concentrations varied little throughout the study area and no significant 'hot spots' were detectable in the individual plot results. Data from the initial (2004/2006) sampling indicated that lichens from PRWI plots had significantly lower mean concentrations of sulfur, Pb and Cu. This trend continued in the resampled sites in 2009. No significant differences in mean concentration of Hg or Zn were observed throughout the study area. Concentrations of Cd and Cr were either very low or below detectable limits. Table 3. Summary of element concentrations (µg/g ± S.D.) measured in Flavoparmelia caperata for 2004 (top values, clear) and 2009 (lower values, shaded). For HAFE and MANA, first samples were collected in 2006. A link to the complete element dataset is available for each entry. NR = not resolvable. Nonmetric multidimensional scaling revealed significant patterns in both the 2004 and 2009 elemental datasets (Figure 2). Based on these analyses PRWI plots were clustered separately from the others, a result consistent with the summary data shown in Table 3. Increasing concentrations of elements on the ordination axes can be visualized with reference to the S concentrations (red line on the ordination), which are significantly correlated with the axes as shown. Figure 2. NMS ordination of lichen elemental data obtained at each of the plots established in the NCR for which element data were collected in 2004 (left) and 2009 (right). For reference, the red lines indicate the specific correlation of S concentration with the axes in each ordination. Taken together, the floristic and element data suggest that nitrophilous, relatively pollution-tolerant lichen communities have developed over time in the NCR, probably the result of poor air quality in the past and only slight improvement since. Results are consistent with those of a recent study (McCune et al. 1997) that analyzed lichen community patterns throughout the southeastern U.S. as a part of the Forest Health Monitoring Program. The authors found two major gradients in the data, a macroclimatic gradient from the coast to the Appalachian Mountains primarily related to temperature, and another correlated with reduced air quality caused by nitrogen- and sulfur-based acidifying and fertilizing pollutants. Dominant lichens were similar to those observed in the present study (Punctelia rudecta, Flavoparmelia caperata, Usnea strigosa, Rimelia reticulata, Parmotrema hypotropum, Hypotrachyna livida, Parmelinopsis minarum, Phaeophyscia rubropulchra). There are few comprehensive studies of eastcoast lichen communities, but those that are available (e.g., Lawrey 1993 for Monongahela National Forest, West Virginia and Flenniken 2003 for Rhode Island) report similar floristic results. Elemental concentrations are generally low for Flavoparmelia caperata. Comparison of 2004 samples with samples collected in the past (e.g., values from Plummers Island lichens date from the 1930's) show significantly lower levels of sulfur and metals in 2004, suggesting an improvement in air quality over time. Comparative studies of U.S. lichen element status indicate that presentday concentrations of S and metals in NCR samples of F. caperata are not unusually elevated. Chromium concentrations in the NCR are generally less than 3 µg/g, which is low compared to values measured in other studies. Schutte (1977) found consistently high concentrations of Cr in F. caperata in Ohio. Lichens from industrialized areas exhibited values exceding 20 µg/g, up to a maximum concentration of 69.5 µg/g. Lichens from rural areas had values less than 10 µg/g, but seldom as low as 3 µg/g. In 2004 sulfur concentrations in the NCR samples of F. caperata average 1500 µg/g and are always less than 2000 µg/g. At Plummers Island (see CHOH09 site), S content in F. baltimorensis has declined steadily since 1983 when the concentration was 2500 µg/g. In 2004, the concentration was 1660 µg/g. At Whitetop Mountain in southwest Virginia, Kinsman (1990) found an average S concentration of 1500 µg/g for F. caperata, with values generally less than 2000 µg/g at all elevations and azimuths. A study in Shenandoah National Park found that S concentrations in F. caperata and F. baltimorensis were generally less than 2000 µg/g except in rare cases (Lawrey 1985). Sites where both species had elevated concentrations were always in the Northern District of the Park. High concentrations of S are also generally found at higher elevations in SHEN (Lawrey and Hale 1988). In Monongahela National Forest, West Virginia, mean S values in F. caperata were 1450 µg/g at Otter Creek Wilderness and 1570 µg/g at Dolly Sods Wilderness in 1992 (Lawrey 1993). Pb values in 2004 samples are generally low (consistently less than 50 µg/g) throughout the NCR. Lichens collected at Plummers Island (see CHOH09 site) for the past 100 years document dramatic increases in atmospheric Pb deposition prior to the early 1980's. At this time, leaded gasoline use was phased out in the U.S. and Pb concentrations in lichens began to sharply decline. This trend has continued to the present. Hg levels in lichens are generally moderate (average 0.15 µg/g) and probably reflect background levels for the eastern U.S. However, there are few comparative data available. No obvious hot spots were detected. A study in southwestern Pennsylvania (Davis et al. 2002) of Hg uptake by the lichen Punctelia rudecta showed concentrations of Hg ranging from 0.15 - 0.20 µg/g. Higher Hg levels were measured for the lichen Letharia vulpina in Yellowstone National Park (up to 0.243 µg/g, average 0.11 µg/g), probably a result of geyser emissions (Bennett and Wetmore 1999).